I feel there has recently been an increase in references to quite old – and generally outdated – terms, such as Germano-Balto-Slavic and “Indo-Slavonic” (i.e. Satem), described as Late Indo-European dialects. This is happening in forums and blogs that deal with “Indo-European genetics”, and only marginally (if at all) with the main anthropological subjects that form Indo-European studies, that is Linguistics and Archaeology. Firstly, let me go apparently against the very aim of this post, by supporting the common traits that these dialects actually share. Balto-Slavic is a complex dialect, whose known proto-history and history offers already a difficult picture. Contrary to the opinion of many, there is no single document that can identify the terms Antes, Sklavenes, and Venedi with the cultures that are usually identified as speaking languages ancestral to East Slavic, South Slavic, and West Slavic . These names were used interchangeably in the Byzantine Empire, which was obviously not involved in classifying Slavic peoples by their linguistic branches… For more on the historical identification of Slavic tribes, read Florin Curta‘s The Making of the Slavs: History and Archaeology of the Lower Danube Region, c. 500-700 A.D. On the identification of potential candidates for early Slavic and Baltic cultures, you can read the appropriate entries in the Encyclopedia of Indo-European Culture, by Mallory & Adams. Baltic and Slavic tribes seem to have a too recently recorded history to be able to confidently trace back their cultural predecessors. In its recent history, close to the formation of its community, Proto-Slavic must have had intense contacts with Iranian-speaking peoples. Also, previously, if R1a-M417 subclades are in fact the most common lineages expanded with the Corded Ware culture (as it seems now), they have no doubt shared a common language, most likely a non-Indo-European one. Not Indo-European in the strict sense, at least, since it formed part most likely of the Indo-Uralic continuum that must have been spoken during the Mesolithic in Eastern Europe, and a language probably nearer to Uralic than to classic Indo-European. A strong connection between Balto-Slavic and Indo-Iranian in a common Satem branch, as supported by Kortlandt (see e.g. Balto-Slavic and Indo-Iranian 2016, or a reconstruction of Schleicher’s Fable in PIE branches), would imply that a Corded Ware culture from the Dnieper-Donets – speaking a Graeco-Aryan dialect – interacted for centuries with Uralic and other Graeco-Aryan languages, only later influenced by North-West Indo-European (as late as its contact with East Germanic during the Barbarian migration). This model cannot justify the shared traits of Balto-Slavic with North-West Indo-European, unless a third, substrate language – like Holzer’s (1989) Temematic proposal – is added to the equation. Such models are not impossible, but seem too complex. On the other hand, linguistically Balto-Slavic seems to have split in its known branches quite early, and traits such as the satemization trend appear to have affected each main dialect (Baltic and Slavic) differently, as attested in the different ruki development, hence the assumption of its early but different influence of the trend to both Indo-Iranian and Balto-Slavic (or, more exactly, Indo-Iranian, Baltic, and Slavic). 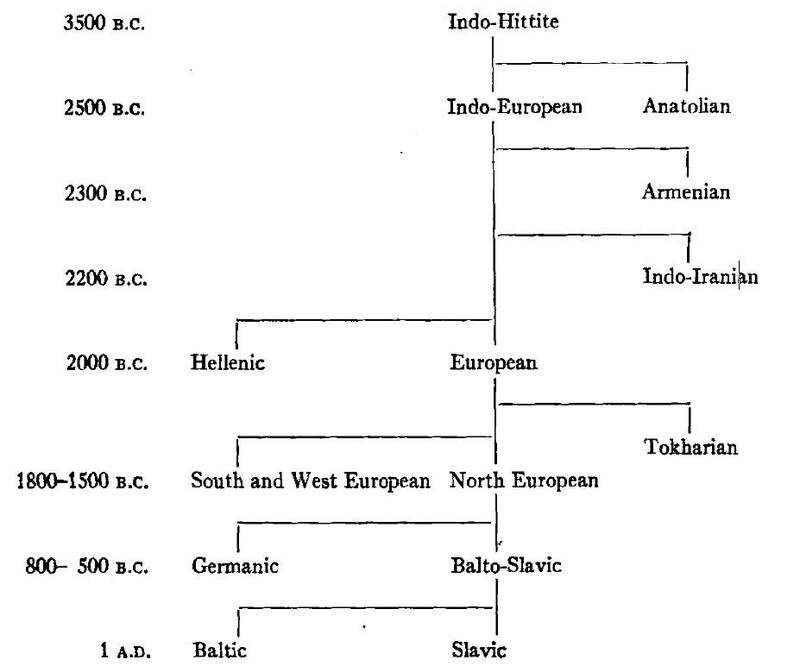 Also, the common North-West Indo-European vocabulary, as well as morphological trends shared by NW IE dialects, clearly affects the oldest layer of both languages (hence the parent Proto-Balto-Slavic too), which predates thus the satemization trend, and further contributes to the idea of a common root between West Indo-European (or Italo-Celtic), Northern Indo-European (the language ancestral to Pre-Germanic), and Proto-Balto-Slavic. A common group between Germanic and Balto-Slavic is justified by the presence of certain common isoglosses, such as the famous shared oblique cases in *-m- instead of *-bh-, and support for such a group is found recently e.g. in Gramkelidze-Ivanov (1993-1994) – who nevertheless support a North-West Indo-European continuum -, or in Jasanoff, for whom both languages (regarding phonological traits) “began their post-IE history together”. On the other hand, such shared traits could have derived either from old contacts – supported traditionally because of their proximity -, or by a common substrate to both without a need for direct contacts, as supported by Kortlandt in Baltic, Slavic, Germanic (2016), among others). The fact that there might have been a different, third language involved – the hypothetic Temematic substrate language to Balto-Slavic, potentially nearer to Baltic because of the stronger superstrate influence in Slavic – further complicates the dialectal identification of Baltic and Slavic – that is, if one supports a common Germanic and Balto-Slavic group. This Northern group was supported by Gimbutas (1952) based on a previous linguistic paper by Trager & Smith (1950) – published in the infancy of dialectal PIE differentiation -, but this model is not mainstream nowadays. The linguistic model followed by Anthony (based on Ringe, Warnow, and Taylor 2002), did not link Germanic to Balto-Slavic (or to Italo-Celtic, for that sake) more than to any other dialect, but it seems that the three might have spread from the same western (Repin-derived) Yamna region, according to their maps. 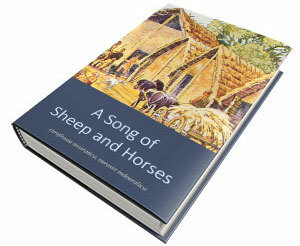 See for example their recent article The Indo-European Homeland from Linguistic and Archaeological Perspectives, which sums up and partly corrects Anthony’s detailed account of steppe migrations in the already classic book The Horse, the Wheel, and Language: How Bronze-Age Riders from the Eurasian Steppes Shaped the Modern World (2007). Dialectal groups and implications are unclear from their publications, with changing linguistic schemes since 2007, but with a quite stable archaeological framework. Regarding Archaeology, North-West Indo-European must have expanded with the westward Yamna expansion, i.e. associated with the Bell Beaker expansion. That was supported in mainstream Archaeology before the most recent genetic studies. 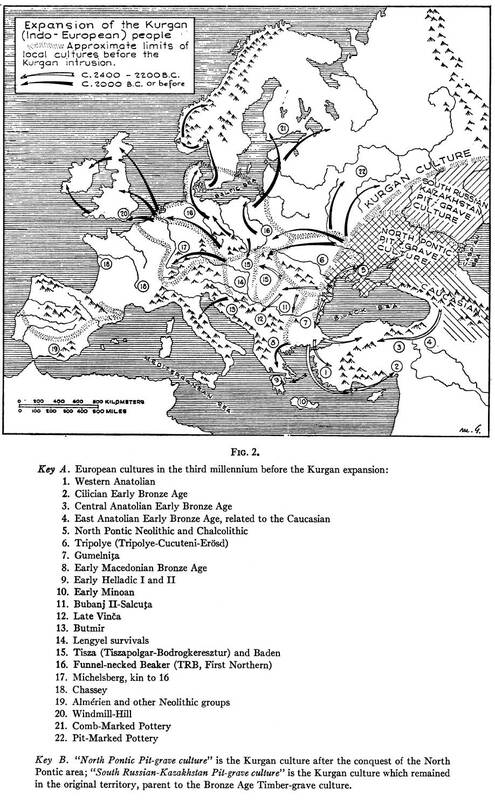 Even Anthony (2007), who has related the Corded Ware culture to the expansion of Indo-European languages through cultural diffusion, recognizing the expansion of Yamna migrants to the west (identifying them with Italo-Celtic and Proto-Greek speakers), has to offer two or three separate cultural diffusion events (! ), whereby Pre-Germanic, Proto-Balto-Slavic, and Proto-Indo-Iranian had been learned by the influence of the Yamna culture on neighbouring (unrelated) peoples of Corded Ware cultures: in Central European – Single Grave culture (from Pre-Germanic Usatovo), Middle Dnieper culture (from Balto-Slavic in the Contact Zone), and Potapovka (from Poltavka) cultures, respectively. No actual spread or migration from Yamna into Corded Ware has been supported since Gimbutas. Balto-Slavic is indeed a complex group of languages – with some supporting (since Toporov and Ivanov proposal in the 1960s) three dialectal groups, composed of East Baltic, West Baltic, and Slavic branches (thus implying an older split of Baltic). Because of the close interaction of eastern Europe with Eurasian invasions, the nature of their language won’t probably ever be solved. Genetics is not the savior that overcomes these difficulties; so long it has only brought more (albeit no doubt interesting) questions, and even though their correct interpretation might offer some new light, we will be far from obtaining a clear picture of the cultural and linguistic development of Proto-Baltic and Proto-Slavic communities. What I am criticizing here, therefore, is this recent revisionist trend whereby PIE must have been spoken by R1a-Z645 lineages, a trend found not only among amateur geneticists. I am beginning to think – judging from online comments, posts or tweets – that this trend is becoming stronger as a reaction to the fact that not a single R1a-Z645 sample has been found in Yamna or its expansion. These new revisionist models depict a common group of R1a-Z645 lineages hidden somewhere in the steppe, sharing some sort of Indo-Germanic (??) 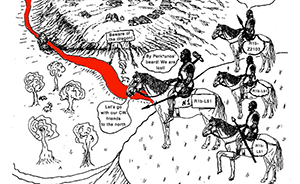 group, or argue for a shared Late PIE community without dialectal divisions, to justify its potential find somewhere marginal to the PIE territory, and then a later development of Corded Ware into Bell Beaker cultures (and, it is implied, peoples). While not impossible, these are unlikely models, not based on knowledge but on wishes, since linguistic data strongly suggest a North-West Indo-European dialect including Italo-Celtic, Germanic, and (at the very least in its substrate and thus western R1a lineages) Balto-Slavic, and archaeological findings don’t show any meaningful population exchange between Corded Ware and Yamna… That is, it hadn’t until after the first famous papers on the so-called ‘steppe admixture’ of 2015, when (surprise!) Kristiansen has already jumped on the bandwagon (and Anthony seems to be beginning to suggest the same) of previously discarded Yamna -> Corded Ware, and Corded Ware -> Bell Beaker migrations. 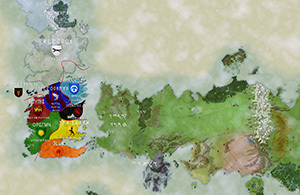 Not a single serious researcher can deny that a hidden community of R1a-417 in Yamna is possible. But no one should support that it is the most likely explanation to the current genetic picture, whether based on Linguistic, Archaeology, Anthropology, or Genetics (be it phylogeography or admixture analyses). I think this recent trend must therefore be the fruit of the influence of previous, deeply entrenched concepts regarding the Corded Ware culture and its link with Proto-Indo-European. These concepts are based on Gimbutas’ Kurgan model, Anthony’s revision of it – explaining the expansion as multiple cultural diffusions (thus renewing Gimbutas’ claim) -, and early studies of modern populations’ haplogroups. Apart from those trends, especially worrying for the future of the field (if it is to be taken seriously), is the interest of some pressure groups, including especially eastern Slavic peoples of R1a lineages, and Finnic speakers of N1c lineages, who are linking some fantastic ancient ethnolinguistic community to their modern national pride. “European dialect” expansion of Proto-Indo-European according to The Indo-Europeans: Archeological Problems, Gimbutas (1963). Observe the similarities of the western European expansion to the recently proposed expansion of R1b lineages with western Yamna and Bell Beaker. You can find support for anything you like in anthropology: there is certainly a paper out there that apparently supports your personal view on prehistoric ethnolinguistic Europe. You only have to do a quick search in Academia.edu, and you can justify whatever new genetic results you personally obtained playing with the freely available datasets and open source software – e.g. from Reich’s lab, or the famous ADMIXTURE. If you are one of those few interested in the field who haven’t tried it out yet, Razib Khan helps introduce you to DIY Genetics, so you can show off some graphics and proportions, like most popular bloggers and forum users are doing. Then you can also publish your results in BioRxiv, just to try it out. So there is no merit at all in justifying these genetic results by supporting a potential anthropological scenario for it. Heck, you can invent it! Here, I said it. Anyone can do Anthropology. In fact, it seems that everyone does Human Evolutionary Genetics nowadays, no matter their background. Some lab knowledge and experience in doctoral research seems to be enough. Intrinsic constraints: You have to understand each algorithm’s intrinsic limitations to be able to apply them correctly, and to derive meaningful but cautious conclusions. Using software commands and obtaining graphics and percentages does not imply you understand the constraints at stake. If you have tried them out, you have seen their great limitations; if you don’t see them, you certainly realize how little you understand of them. 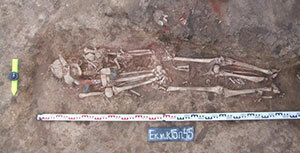 Few DNA samples, from limited sites. Scarce and variable material recovered from these samples. Quality of the retrieval, human errors, etc. Lack of precise anthropological context. Admixture results (whether by professionals or amateurs) are nevertheless often illustrated with tailored anthropological models: in case of the renown papers most likely because of ignorance of anthropological context, broad (philosophical or theoretic) and precise (historical), or lack of sufficient understanding of the different fields involved, and in case of many amateur geneticists also (often) to justify a desire for a prehistoric ethnolinguistic identification similar to their social or political agendas, in a new Kossinnian trend. Admixture analyses are not wrong per se. It is wrong to trust them to inform you of something they can’t; because they need context, and ancient samples need ancient context, which in prehistoric times is obviously quite limited. If you don’t know as much as possible about the ancient context (i.e. Linguistics, Archaeology, Anthropology), you get the wrong conclusions. Period. If you look for papers on ancient context expecting to find whichever model fits your results (or worse, your wish), that is called bias. Don’t expect to get the right conclusions doing that, either. If you find it, that’s called confirmation bias. Such results are not useful. For anyone, not even you, you just deceive yourself and maybe others. Some apparently think that a group of geneticists can achieve a meaningful interpretation of data just by adding one or more archaeologists to the research group – or as ‘co-authors’ of individual research papers. Wrong again. Ten people with IQ 20 don’t make the reasoning of a person with IQ 200 (not that I believe in measuring intelligence, but you get the point). Similarly, twenty researchers, each one with knowledge exclusively (or almost exclusively) of their own field, can’t achieve a meaningful explanation for the data obtained. Geneticists look for an anthropological model that coherently fits their results. Archaeologists will look for a model known to them that fits the genetic results (or more likely the interpretations thereof) they are given. That way, when working together, they can achieve a common ground. If neither of them understands the complexities and shortcomings of the others’ materials and methods (and their whole background), the results will be formally correct, but still wrong. 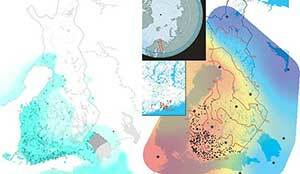 They need to know all aspects involved in the others’ fields in great detail, to understand all potential implications of new data. Since the advent of ancient DNA samples and especially PCA analyses, phylogeography (leaning predominantly on Y chromosomes) has been relegated to a (probably deserved) second place in assessing DNA samples. However, as Razib Khan states, “in the scaffold of the ancient DNA framework it can resolve some issues”. I think this is one of those issues, an issue that is not trivial at all – in that it affects migration models from the steppe at a critical period of linguistic expansion -, and the shortcomings of not relying on it are becoming quite evident with each new publication. Many amateur geneticists that support the mainstream genetic models of the past two years don’t like the ad hoc explanations that others have been constantly giving to support their previous theories. After all, it seems unfair that some people would reject data that offers an obvious prehistoric picture of populations, because of the unwillingness to change one’s own preconceptions, right? For example, against the mainstream steppe migration theory, we have those who support that R1b must have been western European (Palaeolithic or Mesolithic) hunter-gatherers expanded from Iberia; or those who want R1a to have expanded from India. No matter how strong the evidence is against those models, some groups harbour a desire to fit anything in one’s previous image of reality. However, some people who can’t stand those absurd ad hoc explanations and rationalisations, are quite ready to embrace the idea that, somehow, during the Chalcolithic expansion of Yamna, an imaginary community was formed where communities of divergent lineages R1a-Z645 (found mostly north of the steppe and later in Corded Ware cultures) and R1b-M269 (found mostly in the steppe and later in the cultures known to have evolved from Yamna, like Afanasevo, Vučedol, and Bell Beaker) lived together and spoke the same language for centuries, or even millennia. And that community would have existed after a Late Neolithic westward expansion of the Khvalynsk culture, and another westward expansion of the Repin culture, both of which probably reduced the diversity of Y-DNA lineages within Yamna: the first to R1b-M269 lineages, the second to R1b-L23 subclades. Both communities of R1a and R1b lineages, described then as united until the Yamna expansion (although no sample of R1a-Z645 subclade has been ascribed to any steppe expansion) would have expanded somehow separately, R1a-M417 exclusively to the north into Corded Ware – without any migratory connection found between Yamna and Corded Ware in mainstream Archaeology -, and forming thus dialectal groups (like “Germano-Balto-Slavic” or “Indo-Slavonic”) that are not supported by mainstream linguistics. On the other hand, R1b-Z2103 and R1b-L51 lineages, which were already separated within Yamna and probably forming different communities, are known to have spread to the west with the Yamna expansion, in some places and cultures they are found together (like Bell Beaker), which would be expected in a common migration of separate groups. No single R1b-L23 sample has been found in the Corded Ware expansion, no single R1a-M417 individual in the Yamna expansion. These convoluted explanations of how R1a lineages must have spoken Indo-European are based on the assumption that admixture analyses (from the current limited data, with the current wrong interpretation of their context) necessarily means that Corded Ware peoples spread as Yamna migrants – hence R1a lineages must come from Yamna – and then spread into Bell Beaker. It is possible, and in my opinion expected, that eventually some R1a-M417 subclade will be found in Yamna samples (east or west), and some haplogroup R1b-M269 (especially R1b-L23 and subclades) will be found in samples from Corded Ware cultures (west or east). Indeed, there must have been close contacts between both cultures (between Yamna–Southeast Europe–East Bell Beaker and Corded Ware), and not only through female exogamy. It would be quite strange not to find a single R1b-L23 sample in Corded Ware cultures, or an R1a-M417 sample in Late Proto-Indo-European-speaking territories. Those scattered samples, whenever they are found, will probably not change the data: but they might give a reason for some to keep supporting a model that is not the most likely one. It won’t still be the most reasonable, the simplest model that explains all data. Older models – older even than Gimbutas’ kurgan model of the 1950s, as you can see -, by presupposing an instant breakup of a unitary Proto-Indo-European language into different linguistic communities without previous dialectal relation with each other, cannot explain our common European linguistic heritage. 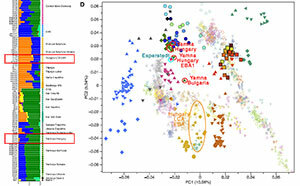 More recent models based on recent genetic studies (and on outdated or newly invented linguistic and archaeological theories), by trying to connect genetically (directly) modern eastern Europeans with Proto-Indo-Europeans, are in fact disconnecting Balto-Slavic peoples from the rest of Europe for three thousand years, and connecting them either with Uralic or with Indo-Iranian speakers. Ethnolinguistic identification, however, is not about genetics – and it has never been, and I hope it will never be -; it is related to self-identification into groups, and more broadly to a common culture, and often specifically a common language. In terms of language, it makes sense to support a situation where Balto-Slavic was a North-West Indo-European dialect (sharing a common language ancestral to Germanic and Italo-Celtic too), with certain ancient (Uralic?) innovative traits shared with Indo-Iranian and partly with Germanic (but with no direct contacts necessary between these branches). Its recent transition to a Baltic and Slavic proto-languages, already by eastern European groups, shows their strong external influence from Uralic and Iranian, respectively, so an identification of Balto-Slavic with the expansion of R1a lineages is probably to be found in a western group of R1a-Z282 subclades expanding eastwards between the Bronze Age and the Iron Age. Eastern Europe’s Indo-European heritage (Balto-Slavic) is therefore connected to the western European one (Italo-Celtic and Germanic), each with its own linguistic substrate and influences, but with a common, shared ancient language. 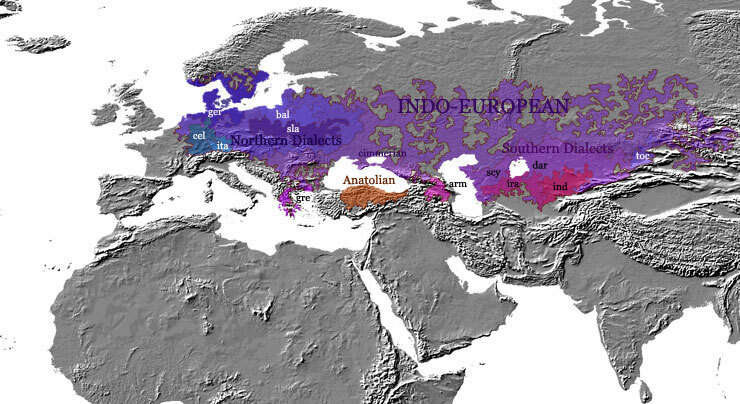 North-West Indo-European derived in turn from Late Indo-European, a language ancestral to Indo-Iranian and Palaeo-Balkan languages, the latter showing continued contacts with western Europe for millennia. In the minimum-case scenario – for supporters of a Satem proto-language like Kortlandt – the language substrate to Baltic and Slavic must be a North-West Indo-European language (to fit its shared traits with North-West Indo-European), like Holzer’s Temematic (a hypothesis which Kortlandt seems to support) that would have then been recently absorbed by Satem speakers of Eastern Europe. In that context, central European R1a-Z282 lineages (which form the majority of West Slavic lineages) would have spoken that NWIE language for millennia , until proto-historic times, when a cultural diffusion of a Graeco-Aryan dialect (mainly spoken by R1a-Z93 or eastern European R1a-Z282 lineages, then) would have happened in eastern Europe, and then a cultural diffusion (or demic diffusion?) of Slavic-speaking peoples would have happened to the west, into central Europe. In none of these scenarios is any sort of Proto-Indo-European -> Balto-Slavic ethnolinguistic, genetic, or territorial continuity to be seen. The former model is not only the simpler explanation for Slavic and Baltic, but it is also the communis opinio today by most Indo-Europeanists, it is supported by Archaeology, and Genetics is likely to keep supporting it with each new paper. I don’t find anything shameful, or that could diminish modern Baltic and Slavic identities a bit, by accepting any of those models, so I don’t understand the imperative need some people seem to have of identifying R1a lineages with the Yamna expansion and thus Proto-Indo-European. For those who will still be vying for a more prominent role of haplogroup R1a in the Proto-Indo-European ethnogenesis, there are alternative older scenarios to the arrival of Proto-Indo-European to the steppe, as there are older models for an Anatolian origin of PIE. 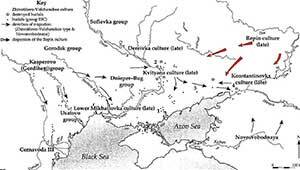 So, for example I already laid out the possibility that the invasion of R1a-M417 brought Indo-European (or, more precisely, Indo-Uralic) to eastern Europe – as part of a Uralo-Yukaghir or Paleo-Siberian group -, while R1b communities may have originally been speakers of Afroasiatic (cf. R1b-V88 and the potential Afroasiatic homeland in Lake Megachad), and R2 would have been associated with the spread of Dravidian (and maybe Kartvelian and Altaic), all of them departing from a common Nostratic associated with haplogroup R. This model could find support in genetics in the link found between Mesolithic Northeast Europeans and Neolithic Siberians, from an Ancient North Eurasian (ANE) population probably rich in Y-chromosome haplogroup R1a. This is just one of many highly hypothetic ancient scenarios, and it requires more assumptions than a continuity of Indo-Uralic (or even Indo-Uralic and Afroasiatic) with R1b lineages – R1a potentially marking the spread of Paleo-Siberian languages -, and above all it is based on controversial linguistic macrofamilies, not (yet?) supported by mainstream anthropological disciplines. It is nevertheless one theory certain romantics can place their hopes in, as R1b communities of the steppe become accepted as those originally speaking (Middle and Late) Proto-Indo-European in the steppe. I am not saying I am right. There is still too much to be said and corrected. In fact, I could be wrong, and we may lack a lot of interesting data: there might have been a late R1a-R1b North-West Indo-European-speaking community within western Yamna, and we might need to revise what we knew about Archaeology yet again (and maybe even Linguistics!) before admixture algorithms; then maybe geneticists have come to save the day after all. However, all anthropological evidence points strongly (and genetic studies more strongly with each new study) to the image we had previous to the first genetic data based on haplogroups. I think it is preposterous of some researchers (no matter if professional or amateur geneticists, or archaeologists, or even linguists) to think algorithms can beat more than two hundred years and thousands of works on this matter. In Academia, mathematics rarely revolutionize a field; it could usually help, but it can just make you sound scientifish, and point in the wrong direction. And no, I am not smarter than the rest, I can only judge from what I know, and that is always too little, far less than I would like to. But maybe I am in a more neutral position regarding the end result, given my renewed skepticism in revolutionary methods to solve academic problems, and my indifference as to a western European or eastern European origin of R1b or R1a lineages. And I am not alone in my lack of confidence in the interpretation of recent genetic admixture results – read Voker Heyd’s papers, for example, if you want the view of a renown and experienced archaeologist who was in the field of Indo-European studies earlier than any of those now popular geneticists. 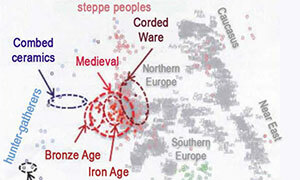 In fact, I also fell for the R1a-Corded Ware expansion of Late Indo-European, and before many in the Anthropological fields, and with even less proof, back when we only had haplogroups of modern populations and the promises of Cavalli-Sforza. When I decided to publish a grammar to learn Indo-European as a modern language, the aim was to offer a mainstream reconstruction of Late Proto-Indo-European without adding my own contributions; despite this, I added the newly, archaeogenetically-supported Corded Ware migration model (see A Grammar of Modern Indo-European, Third Edition, pp. 74 and ff.). Chalcolithic expansion from Yamna into Corded Ware (as early North-West Indo-European dialects), as interpreted in the second edition of A Grammar of Modern Indo-European. Recent papers, when compared to what linguists and archaeologists had been saying for years – before even Y-DNA haplogroup was a thing for any of these now popular genetic labs (not to speak about internet geneticists) -, leave little space for doubt right now. 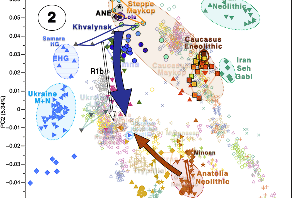 I embraced the results of haplogroup analysis of modern populations, which seemed to support an expansion of Proto-Indo-European R1a-lineages with the Corded Ware culture, and dismissed thus Gimbutas’ and Anthony’s model (of a Yamna -> Bell Beaker expansion of Italo-Celtic). I also embraced the results of the publications on genetics of 2015 with open arms. But, I was able to change my mind when the careful observation of individual samples of these recent studies began to contradict what we thought, and I did so publicly only recently (publishing the Indo-European demic diffusion model), and more strongly after the latest papers (publishing the updated second edition), without remorse. And I will reverse that decision again if needed, and change it again and again as I feel necessary, no matter how many times. In Science, to adapt to new data does not make you a brownnoser, it makes you a scientist. Not to adapt to new data does not make you a man of firm ideals, or any chivalrous concept you might have about that, it makes you look ignorant and biased. It’s that simple. Some of you may think that there is a third way: to keep an old, now unlikely idea you have supported in the past, but not bragging about it in the meantime until it is proven fully wrong, just in case it is demonstrated to be right in the end – because then you might claim you were right all along, like you had some magic understanding or hidden data the rest of us didn’t. I don’t think that’s the correct way to behave in a scientific environment, either. That makes you a coward. And you wouldn’t have been right all along: you would have been right, then wrong, then right again. Everybody can see that, and so do you. Geneticists working on future publications should be planning ahead of what might happen. The overconfidence of Haak et al. (2015), Mathieson et al. (2015), and Allentoft et al. (2015), including Lazaridis et al. (2016), in supporting a Yamna -> Corded Ware migration, and a Corded Ware -> Bell Beaker migration are understandable in a rapidly growing field that didn’t leave enough time to study complex anthropological questions. The recent errors of following that simplistic and wrong model in Mathieson et al. (2017), and Olalde et al. 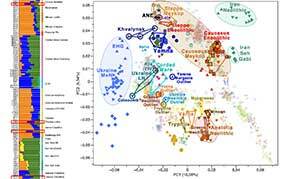 (2017), coupled with Kristiansen’s (2017) and Anthony’s (2017) new interpretations (to fit the conclusions of those genetic studies), can be forgiven, because of all the fuss created around the Steppe admixture concept, and the desire of journals to publish popular papers, and of researchers to go with the tide and gain some popularity along the way. From now on, however, if the evidence keeps pointing in the same direction, a lack of attention to anthropological detail will be simple wishful ignorance, and that cannot be forgiven in any field that strives to ascertaining the truth. If continued, this trend will damage the field of Human Evolutionary Biology for years – at least in the view of anthropologists, who are the real filter of this field’s conclusions -, when its current results prove wrong. Genetic studies will be banished from anthropological studies, dismissed as a pseudo-science, and avoided by any scientific or academic journal worthy of a minimum self-respect. 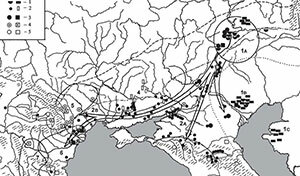 To regain trust in a field that purportedly uses “more scientific methods” but is nonetheless proven that wrong for years in its essential assumption (a Yamna -> Corded Ware migration model), and especially when it is associated with the traditionally despised ‘Kossinnian trends‘, will be a hard task for those involved. So many postdoc offers in so many labs being created right now will vanish, as the interest in publishing papers of this discredited field will disappear. This could also threaten the recently renewed impulse by archaeologists and linguists of migration models, which had been rejected for a long time, giving impulse to those who deny them ( e.g. in the UK and in France), or who just don’t want to see Archaeology or Linguistics get involved with such a controversial question, or even between each other. High-impact factor journals like Nature, Science, PNAS, and those not so famous, as well as their reviewers and readers, are doing a disservice to the endeavour of ascertaining the historical truth, if they allow this to happen without protesting. But such consequences for the field will be their making, and not that of suspicious anthropologists, who do well in distrusting any revolutionary results published by overconfident researchers from newly developed and too broadly defined subfields.